I have been lucky to meet a number of other SEN bloggers in person, one being Steph Curtis, of the Steph's Two Girl's blog. 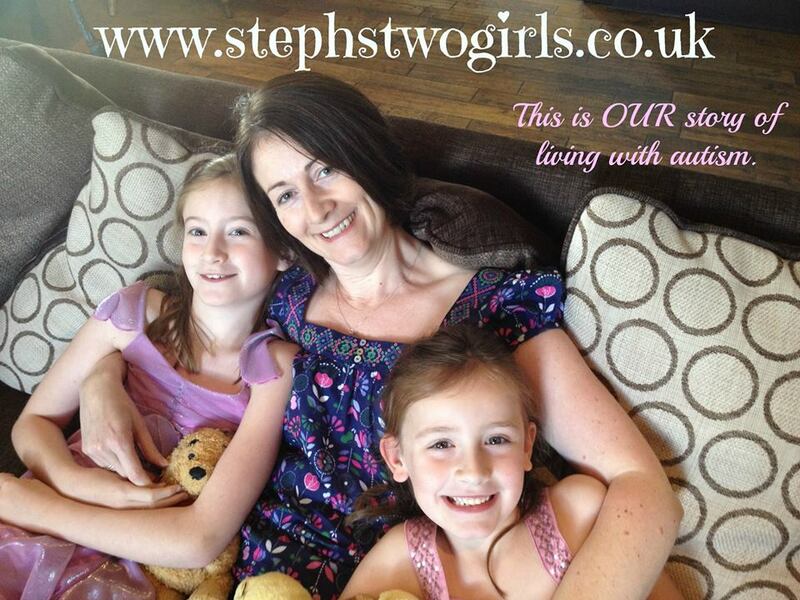 Steph, for those who don't yet read her blog (I'm sure when you do, you'll become a regular, like me) writes about both girls but, in particular, her youngest's struggle with Autism and Pathological Demand Avoidance. Hers is also one of the families up and down the country to have been participating in the "pathfinder" trials, testing out various aspects of the new SEN reforms which are due to take effect in September (allegedly). She has kindly written for SNJ about her and her family's experiences so we can see "behind the scenes"
A while back, the lovely Tania asked if I could write a piece for Special Needs Jungle about being part of the Pathfinder process. To be honest, it was more than a while ago and I’ve been feeling terribly guilty for quite some time about not putting fingers to keyboard sooner. However we’ve recently been through a review process and so I feel at least now we can give you an even fuller update… So let’s wind it back – what is the Pathfinder process? Back in October 2010 the Government launched its Green Paper on children and young people with Special Educational Needs and Disabilities, followed by a consultation on this in March 2011. Sounds impressive, doesn’t it? A lot of work has been done along the way to contribute to the Children and Families Bill which has now been given the Royal Assent and will become law in September 2014. We are currently awaiting the Code of Practice which should give the finer details as opposed to the ‘top-line’ ideas. At some point in this process our county became one of the nine 'Pathfinder Champions' – presumably that meant that Government thought they were doing a good job with their testing and were able to lead others. It was around September 2012 when I first became aware of what was going on, but I couldn’t claim to understand the process at that point. I just knew that changes to the SEN systems were on the way and the only way I would get to really understand what was happening would be to be a part of it. Our LA asked for volunteer ‘pilot’ families, but at first they were looking for specific candidates – families with children who were at an important transition point. Our daughter, Sasha, was in Year 1 at school and already had a Statement of SEN, so we initially weren’t considered. A few months passed and they asked for more families to join in the testing. I think it was around the fourth time of asking (I kept expressing interest, patience is a virtue) that we were accepted and officially became a Pathfinder Pilot family. The next step was for us to be allocated a Keyworker (this role has now been renamed in our area as Facilitator) and the Educational Psychologist who had visited Sasha twice at school was chosen for us. We were happy enough with this choice, as it was at least somebody who we felt had observed Sasha and reported back with a good understanding of her issues at school. We were then visited at home by our Keyworker and the Co-Ordinator (our SEN Officer), and they talked through the process as far as they knew it – it was of course all completely new to them also! Within the next few weeks we were due an annual statement review, and so we carried on with that as per usual, but ran an extra meeting off the back of it to fill out the proposed Education, Health and Care Plan (EHCP) paperwork. We were lucky that our school was amenable and happy to be part of this programme – I think like us, they felt that it would be better to be ‘in the know’ up front rather than wait for the changes of the Children and Families Act to hit. We were quite happy with the EHC Planning process, and in particular with the format of the new paperwork. The template for our county was very user friendly, and very much more about the whole family and our lives around school hours rather than just taking an educational slant. We had no social or health input, which kind of goes against the fact that it is supposed to be an Education, Health and Care Plan, but luckily for us we don’t have major issues in those areas. Still, it would have been nice if either of those departments had shown willing…. Some months after that review meeting we were issued with an EHC Plan, sadly full of spelling mistakes and grammatical errors where info had been ‘cut and pasted’ wrongly, but at least the Plan itself was there. The revised Statement followed also – another wedge of paper to stack on my shelves. Our school has been pro-active to our daughter’s needs and so over the next 8-10 months I had no need to refer back to either document. About a month before the time of the next annual review, I asked our SEN Team (when I finally tracked down who the SEN Officer was) if it would be possible for us to just convert to the new EHC Plan rather than go back over the Statement paperwork. It took a while before I got an answer, as initially nobody seemed to know if that was going to be possible. When the answer came back positive, school were in agreement as long as they would only have one set of forms to return and so we made the brave jump to an EHC Plan. The school SENCO was keen to call a meeting for the review with plenty of notice. Bearing that in mind, it was somewhat disappointing to find ourselves two months later in a room without our Facilitator (it transpired she only works part-time and the meeting day was not one of her work days) and also without our Autism Advisory (now Social Communication Disorder Team) contact who has previously observed Sasha (although admittedly only once a year since Reception - so twice, plus a very hastily re-arranged observation 3 days before the review). There was no Speech and Language Therapist present, no Occupational Therapist, no Educational Psychologist (our Facilitator), no-one from Health and no-one from Social Care. The relevant practitioners’ reports all arrived only a few days before the meeting. I found the new EHCP template online the night before our review (I had asked for this, but it wasn’t forthcoming) and proceeded to populate it myself. I’ve been wondering ever since why I agreed to let the meeting go ahead, but in truth I was totally immersed in work around that time and barely had time to write up my own notes. A Facilitator would have been extremely helpful and I feel we would have got a lot more out of the process if we’d had one present. Facilitators (or Independent Supporters) are agreed as part of the future plans and I’ll certainly be making sure we have one available next time. Following the review, I emailed my fully typed document (which hadn’t been disagreed with by anyone at the meeting) over to the SEN Officer. Three weeks on, I’m still waiting for the final document. However, all things considered, I’m happy that changes have been made and that the new Bill has the needs of the Children and Young People at its heart. It will just take a long time to alter the poor attitudes and processes which have been ingrained with both parents and practitioners over for such a long time. Not the best start, but precisely why parent volunteers are critical for the Pathfinder pilots. Our children and families have a lot to gain, and parents and practitioners so much to learn. And still no COP! The current system leaves so much to be desired. Future challenges are no good reason for inertia to the devil of statementing which we know all too well. Well done Steph for your insight and the ‘try before you buy’ approach to everyone’s good, hopefully. I bet next year’s meeting has the right people there!